The last great living qawwal. 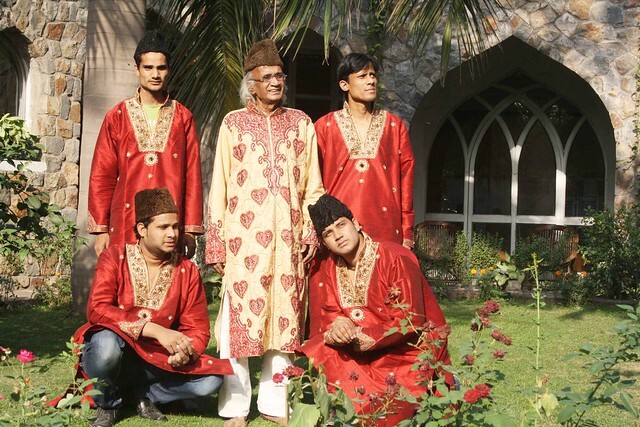 In his eighties, Meraj Ahmed Nizami, the patriarch of Nizami Khusro Bandhu family, is one of the few classical qawwals left in India. He is one of Delhi’s great living landmarks. 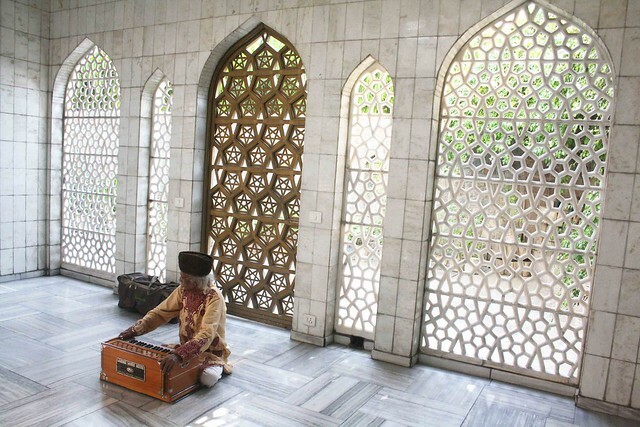 “Meraj renders Persian Sufi verses most fluently in the old tarz, or melodies,” says Farida Ali, director of the Dargah of Hazrat Inayat Khan, which is in the same neighbourhood as Hazrat Nizamuddin’s shrine. 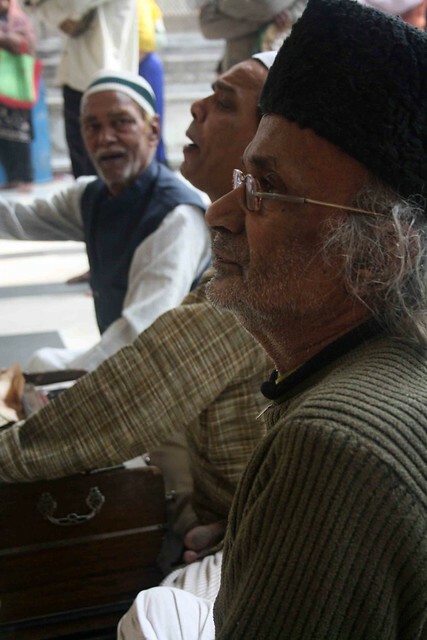 Meraj’s family, who daily performs in Hazrat Nizamuddin’s dargah, has been performing qawwali, Islam’s sacred music, every Friday in Inayat Khan’s shrine for 40 years. “I have witnessed him creating a dynamic spiritual atmosphere of mystical haal (ecstasy),” Ms Ali says. 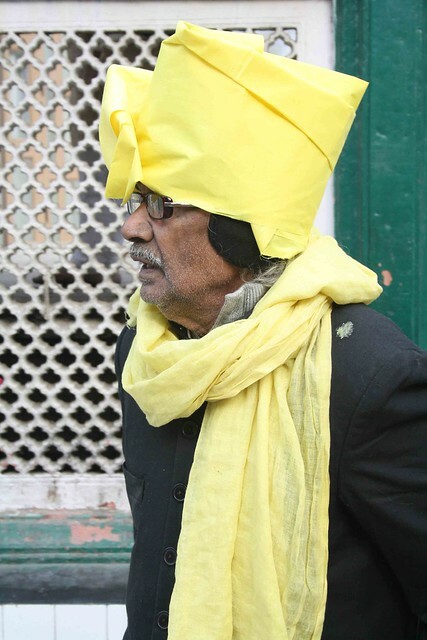 The man who is considered a legend lives with his five sons, one daughter and two grandchildren in a one-room house in Nizamuddin Basti, the historic village in central Delhi that sprang up around the 14th century Sufi shrine. 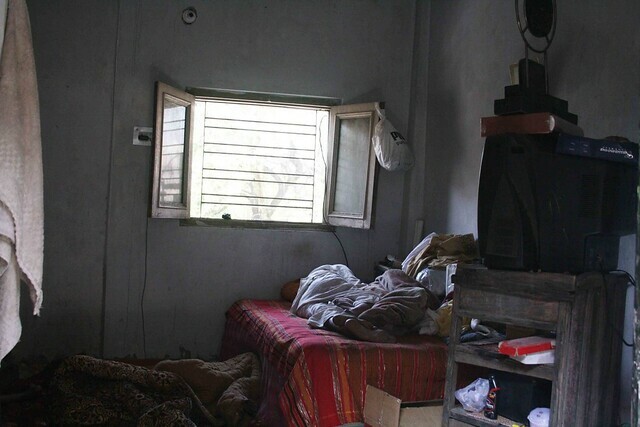 Inside the home, there is one bed, which is taken over by Meraj and his books. A corner of the room is stacked with two harmoniums. The floor is laid with a mattress on which the family sleeps. The wall is decked with a “likeness” of Hazrat Ali, the cousin and son-in-law of Prophet Muhammad. A cardboard box of squawking chicks is kept below the TV stand. The steel almirah is broken. The window looks on to the Barakhamba monument, across Mirza Ghalib Road. This is the home of a qawwal whose grandfather’s grandfather was the shahi gawayya (royal singer) in the court of Bahadur Shah Zafar, the last Mughal. 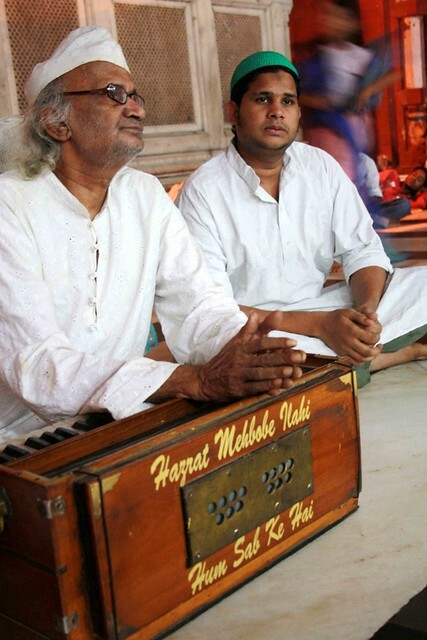 Ustad Tanras Khan, founder of the Delhi Gharana, taught music to Zafar. His lineage is traced to Mian Samad bin Ibrahim, the leader of the Qawwal Bachche, a group formed by Amir Khusrau that is believed to consist of the world’s first qawwals. Khusrau, a court poet to seven Delhi Sultanate kings, was closely associated with the evolution of Hindustani classical music. A disciple of Hazrat Nizamuddin, he was buried close to the Sufi’s tomb. 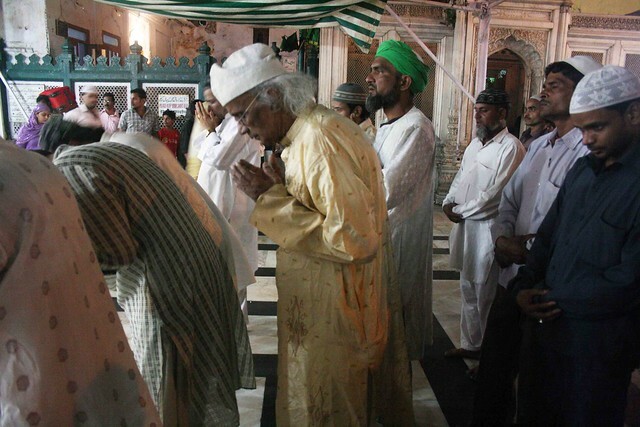 The tradition is to first pay respects to Khusrau before entering Hazrat Nizamuddin’s grave chamber. 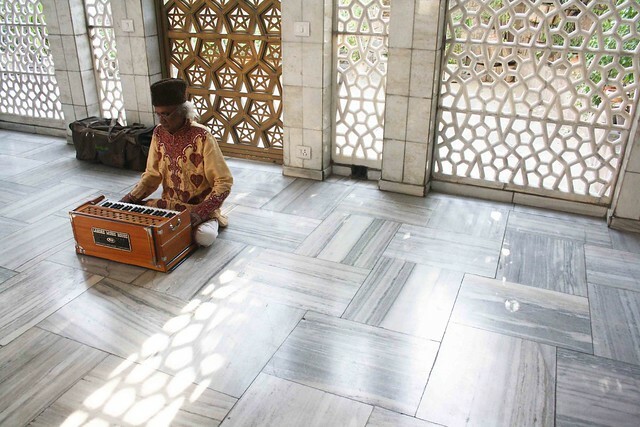 The two tombs are separated by a marble courtyard, the venue where Mian Samad’s descendants have been singing qawwalis through the centuries, right down to Meraj and his sons. Every day the qawwalis are offered here. Thursday evening is special because it precedes Friday, the week’s holiest day in the Islamic calendar. 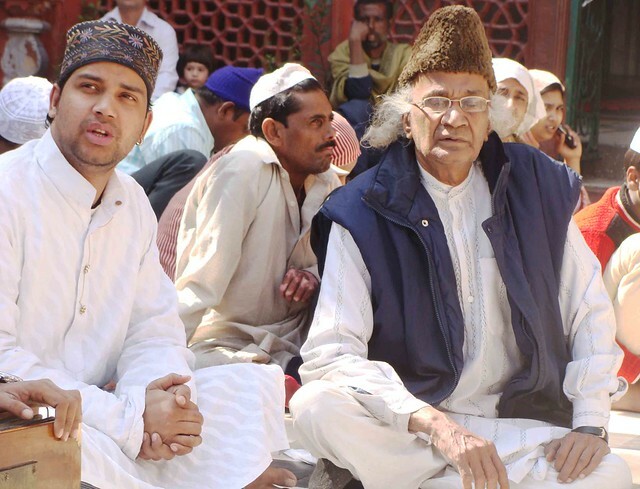 Out of the several qawwal families that sing in the dargah, only Nizami Khusro Bandhu and the family of Nizami Bandhu, who are related to Meraj by marriage, live in the dargah’s vicinity. A classical Sufi singer who never takes his kalaams (verses) lightly, Meraj has a personal repertoire of poetry that has come down to him from his ancestors. He sings Rumi’s Masnavi fluently in its original Persian version, a rare feat among qawwals. Like Pakistani Sufi singer Abida Parveen, his ability to add girah is legendary. Girah is a special aspect of classical Sufi qawwals where verses from various poems are seamlessly woven into one single qawwali. For instance, if Meraj sings a Khusrau poem, which has verses in Persian and Purabiya, he manipulates the composition by bringing in Kabir Das or Bedam Shah Warsi in the Purabiya portion, and Rumi or Jami in the Persian segment. Meraj’s standards are not easy to follow, some say, not even by his sons. Once Meraj deigned to shoot a qawwali sequence for a film, which turned out to be embarrassing. “I didn’t know the story.” It was Deepa Mehta’s Fire, a film about lesbians. About 20 years ago, Meraj had twice the energy. He led the mehfils during the Urs of Hazrat Nizamuddin and Amir Khusrau. He also headed the qawwali gatherings in other dargahs, in and outside Delhi. Always dressed in pyjamas, achkan and topi, the erudite qawwal didn’t just recite the verses, but explained their subtleties. Artistically, he was a snob and a qawwal had to be truly accomplished to earn his respect. Professionally, he never cared for money and was focused on keeping his form’s purity. The structure of Regula Burckhardt Qureshi’s seminal book on qawwali, Sufi Music of India and Pakistan, is entirely presented through the repertoire and performances of Meraj. What will happen once Meraj leaves the scene? Meraj is usually spotted in Hazrat Nizamuddin’s dargah during the mornings. He is seen sitting quietly amid the younger qawwals in the shrine’s courtyard. Awesome post Mayank .It’s really sad to hear that nowadays, only few people care about the purity of Art. Everybody wants to get famous even if they have to compromise on the artistic quality. On the other hand, it felt nice to read that there are still ” Great people like Mr. Meraj ” who can go to any length for the sake of preserving the Qawwali. Now that you have introduced us to him, I really want to listen to him so a visit to Dargah is in order. We live in times when “re-mixed’ qawwalis and “Sufi music” is more a fashion statement than a spiritual tradition. The verses of original kalaam’s are not understood by many and even fewer people really understand the meaning. Sadly, when Baba Bulle’s kalaams are fused with guitar and drum and lauded for “modernizing the tradition”, I feel very few will miss Meraz. Does he have any recordings for those of us to listen since we cannot make it to the Dargah ? Mayank – Use your considerable influence to get a recording of this man before it is too late!